The MicroVue CH50 Eq EIA is for the measurement of classical pathway hemolytic assay. This kit involves three basic procedures (1) complement activation; (2) sample dilution; (3) assay for total TCC generation. To activate the classical pathway, heat aggregated gamma globulin (Activator) is incubated with the samples and controls. During this incubation the classical pathway is activated and TCC are generated. The activated sera are then diluted and dispensed into the pre-coated assay plate. After incubation, the plates are washed and the bound TCC from the controls, standards and samples are detected. The color generated by the reaction of the HRP conjugate and the substrate is proportional to the number of TCC in the sample. The number of TCC generated under these conditions is proportional to the CH50 of the test sample. 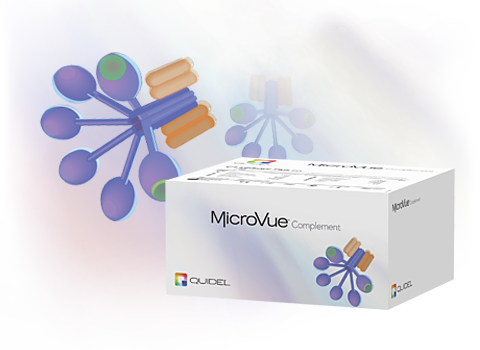 The MicroVue CH50 Eq EIA is designed to measure total hemolytic complement (CH50) in human serum samples. The measurement of CH50 allows detection of deficiencies of one or more complement components (C1 through C9).